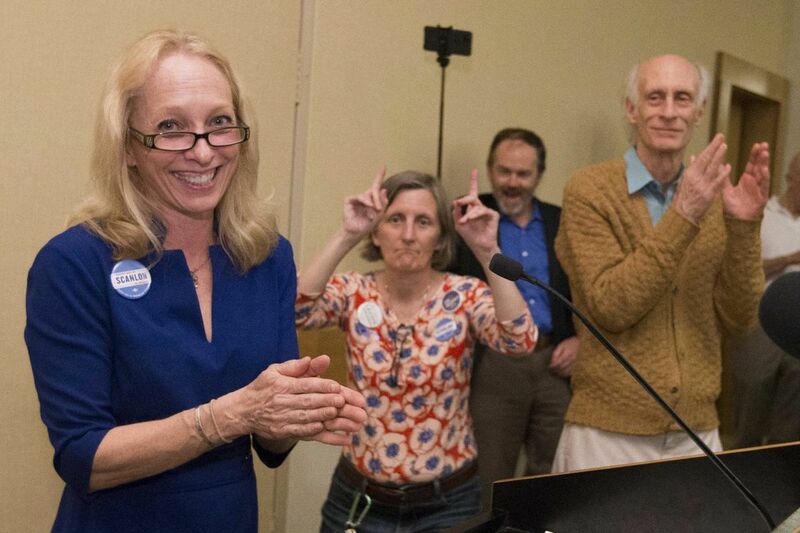 Mary Gay Scanlon, at her victory party in Swarthmore, won the Democratic nomination in Pennsylvania’s newly configured Fifth District. She is a member of the Wallingford-Swarthmore school board. The most crowded primary in Pennsylvania for Congress has a winner: Mary Gay Scanlon. Scanlon, an attorney and member of the Wallingford-Swarthmore school board, received a plurality of the votes in the crowded Democratic contest for Pennsylvania's Fifth District, with of 94 percent of the precincts reporting, according to unofficial returns. The race for the Fifth, which includes all of Delaware County and parts of South Philadelphia and Montgomery County, attracted more female candidates than any other any congressional district in the country. Six women ran for the seat, leading some Democrats to believe they would split the vote and ensure election of a male candidate in the “Year of the Woman.” Delaware County Democrats also worried that the numerous suburban candidates would divide the vote and hand the seat to a city candidate. Scanlon, a Delaware County resident, faced four men as well, including longtime suburban State Rep. Greg Vitali and former deputy mayor and South Philadelphian Rich Lazer. A super PAC for Lazer spent nearly $1 million on TV ads, and Sen. Bernie Sanders endorsed him. There are currently no women in Pennsylvania's delegation in the U.S. House, and they comprise 19 percent of the state legislature. Scanlon, who leads the pro-bono program at the powerhouse law firm Ballard Spahr, said recently at a meet-and-greet that "Afghanistan is 19 percent." Scanlon's campaign highlighted her support for gun control and expanded pre-K, as well as her experience as a lawyer for disabled students and refugees. In an interview, Scanlon said she ran for Congress to "continue doing that work" and "because just all of that work feels like it's under attack with this administration." The primary is the most expensive in the region. The candidates and outside groups have spent at least $4.1 million, according to records filed with the Federal Election Commission. However, candidates have only reported spending through April 25. If they spend all the money they've raised since then, that figure will increase to about $5.5 million. That would make the race among the most expensive in the country, according to data compiled by the Center for Responsive Politics. Former Gov. Ed Rendell and Comcast senior executive vice president David L. Cohen were among Scanlon's major supporters. The Inquirer editorial board endorsed her, and a major chunk of her campaign donations came from Ballard Spahr attorneys. The Fifth District, like all of Pennsylvania’s congressional districts, was newly formed this year after the state Supreme Court struck down the former map as unconstitutionally gerrymandered to favor Republicans. The justices imposed the 2018 map. The new Fifth District includes parts of the old First and Seventh districts. U.S. Rep. Pat Meehan, the incumbent in the Seventh, announced in January that he would not run for reelection after it was revealed that he used tax dollars to settle a sexual harassment claim from an ex-aide. The congressman in the First District, Philadelphia Democratic Party leader Bob Brady, also did not seek reelection. The Cook Political Report rates Pennsylvania's new Fifth District as "likely Democratic." Scanlon will face Republican Pearl Kim, who ran unopposed in the primary, in the general election.